According to the United States Department of State website, the official foreign policy goals for our country are “to build and sustain a more democratic, secure, and prosperous world for the benefit of the American people and the international community”. The earth is 70 percent covered in water, 80 percent of all people live in a coastal region, and 90 percent of the world’s commerce operates on waterways (“About our Mission”, Navy.com). The United States uniquely borders the two largest oceans in the world. These oceans commercially and politically connect the United States to Asia, Africa, Europe, and South America. Because of the important geographic considerations, the United States has historically relied on a strong navy to protect its borders and overseas interests. Often, the development or growth of America’s Navy is related to America’s attitude towards foreign policy (Booth 15). Throughout history, how has the United States used the Navy as a tool to exercise its foreign policy? Recently, Eastern countries such as China and North Korea have grown in the political and economic spotlight. What is required to continue the effective use of the Navy to build and sustain “a more democratic, secure and prosperous world” in this part of the globe? When considering diplomatic or martial solutions to foreign affairs issues, we must consider our current relationship with that country and the strength of its navy (Booth 70). I have a strong interest in the history of US foreign policy. In particular, I find it interesting that the Navy has been instrumental in how the US has dealt with foreign threats throughout history. When Cuba imported nuclear warheads a few miles off the coast of Florida, the Navy formed a blockade while the White House reached a diplomatic agreement with the Soviet Union. The Navy is an indispensable department of the military because of the United States’ geography. When I first started writing this article, I couldn’t help but become side-tracked and began reading extensively about the past century of naval history. After spending many hours researching, I grew to enjoy learning more about the Navy’s growth and tactics. This political cartoon of Teddy Roosevelt reflects his aspirations to develop the United States Navy and support countries in Latin America. From 1898 to 1916, America built its obsolete navy in order to weaken European authority in Latin America. In 1898, a pivotal turning point in American foreign policy was the Spanish American War, which inspired America to grow its military strength and authority (Herring 19). It also marked the beginning of the modernizing phase in the American Navy: the replacement of wooden ships with steam-powered ironclad ships (Howarth 279). Former Assistant Secretary of the Navy Theodore Roosevelt realized that America’s Navy needed to modernize if it were to be relevant in global affairs. Following his election in 1902, the United States’ navy went from being the sixth largest navy to the second (Howarth 310). This navy was used to extend America’s influence in the Western Hemisphere. In 1903, America used its new navy to aid Panama’s declaration of independence in exchange for control over the Panama Isthmus to build the Panama Canal (Herring 69). From 1898 to 1916, America played a large role in assisting Cuba and Panama through naval intervention. From 1916 to 1945, America’s Navy was a key factor in prevailing in both World Wars, furthering its military dominance. Before America joined World War I, Congress passed the Naval Act of 1916 which funded 500 million dollars into building 143 naval ships over the course of three years (Howarth 324). During “The Great War”, America’s navy served to convoy troops to the northern coast of Germany. Until the next World War, the United States took an isolationist stance in Foreign Affairs. After Germany signed the armistice which ended World War I, President Woodrow Wilson proposed to Congress a bill which would expand the 1916 program to prepare for potential war against two of America’s commercial rivals, Britain and Japan. However, at the Washington Conference for the Limitation of Naval Armaments in 1921, Britain proposed that Japan, Britain, and the United States all scrap a number of their own capital ships so that each navy would be around the same size. All three nations signed the agreement hoping to prevent future naval conflicts (Miller 197). In 1933, Franklin D. Roosevelt also declared the “Good Neighbor Policy” opposing armed intervention in foreign affairs (Kennedy 561). Until 1941, Roosevelt’s foreign affairs stance against the Germany and Japan was centered around diplomacy and intimidation (Herring 230). After joining the World War II, the American navy played a key role on both ocean fronts. In the Pacific War, the navy’s “island hopping” campaign slowly inched westward until the final Battle of Okinawa in 1945. In the Battle of the Atlantic, the US Navy blockaded supplies shipped to Nazi Germany in order to stretch their war efforts thin (Howarth 410). During both World Wars, America proved that it could use its navy effectively in combat when necessary. Since 1945, the United States has advocated the spread of democracy, security, and prosperity worldwide. While the Soviet Union tried to spread communism, the conflicting philosophies the Soviet Union and America motivated both nations to rapidly expand their navies and advance their technology. Throughout the Cold War, the United States dispatched their navy to Korea, Vietnam, Grenada, the Carribean, and many other countries to enforce their policy of containment. During the 1980s, Ronald Reagan aimed to create a “600-ship Navy” to combat the greater Soviet fleet (Howarth 523). After the collapse of the Soviet Union, America took responsibility as the premier global superpower and has used its Navy as one of the greatest tools in maintaining this position in the world. Though China has historically avoided foreign affairs conflicts, the People’s Liberation Army is still a considerable threat; Beijing is currently prioritizing modern militarization. As of 2015, China’s GDP was twice as large as America’s; their economy is growing much faster than ours (Heginbotham 343). Out of sheer size, China will grow powerful enough to challenge America’s primacy in the near future. Recently, China has been creating islands by transporting sediment on top of coral reefs in the South China Sea. By claiming these new islands scattered among the natural Spratly Islands, China spreads their authority over the waters belonging to smaller countries allied with America like Vietnam and the Philippines (Watkins). About 3.37 billion dollars of trade passes through the South China Sea every year, and these islands would allow China to control a portion of this trade(China Power Team). The Navy could increase its naval influence in the surrounding seas to uphold a strong diplomatic geographic position and to be prepared in case conflict breaks out with China. As China expands its influence in the South China Sea, it grows its political and economic power, and if America also expands their power to multiple bases in the East Pacific, America would limit China’s ability to expand in the South China Sea (Heginbotham et al 352). Though it may seem like rebuilding naval power in East Asia would benefit the smaller countries around China, it is also in our best interest to maintain friendly relations with China. Confronting the Chinese in an attempt to hinder their economic growth may escalate into a much larger conflict and disrupt the peace in Asia (Gompert 84). Preserving the peace in Asia has led to significant economic growth in the surrounding countries and a major conflict would detrimentally impact those nations. The following link is the podcast “The US -China Military Scorecard” featuring Dr. Eric Heginbotham, a principal research scientist at MIT. There are directions on which parts of the interview to listen to specifically, but you can listen to the entire podcast if you would like. First, skip to 1:55-3:50, about China and America’s military capabilities. Next, skip to 15:35-17:10, about Heginbotham’s ideas about how the United States should handle Chinese forces. Finally, skip to 20:10-22:00, about how Heginbotham suggests that American forces should handle the China’s aggressive takeover of the South China Sea. A much more delicate situation, North Korea, a hostile communist remnant of the Cold War, had tested its first nuclear bomb in 2006. In the past year, North Korea tested 20 missile tests, 3 of which were capable of intercontinental range. Both China and America are pressuring North Korea not to use their nuclear weapons; however, the future outcome of this conflict is unpredictable (Kahl). The video below describes the history of North Korea’s nuclear program and US-North Korean relations. North Korea: Can Kim Be Stopped? What Will Trump Give up for Peace with North Korea? Thank you for reading my presentation about the Navy’s role in foreign policy in East Asia! I gratefully welcome your compliments, comments, and criticism about the website page here. Boghani, Priyanka. “The U.S. and North Korea On The Brink: A Timeline.” PBS. Public Broadcasting Service, 4 Oct. 2017. Web. 27 Mar. 2018. Booth, Ken. Navies and Foreign Policy. Place of Publication Not Identified: Routledge, 2015. Print. Dave Oliver, Against the Tide: Rickover’s Leadership Principles and the Rise of the Nuclear Navy(Naval Institute Press, 2014). DePetris, Daniel R., Harry J. Kazianis, Andranik Migranyan, and Nathan González Mendelejis. “What If America Assassinated Kim Jong-un?” The National Interest. The Center for the National Interest, 10 Apr. 2017. Web. 10 Mar. 2018. Gompert, David C. Sea Power and American Interests in the Western Pacific. Santa Monica, CA: RAND, 2013. Print. Heginbotham, Eric. The U.S.-China Military Scorecard: Forces, Geography, and the Evolving Balance of Power, 1996 – 2017. Santa Monica, CA: RAND, 2015. Print. Heginbotham, Eric, and Elizabeth C Economy. “The US-China Military Scorecard.”Www.cfr.org, 1 Mar. 2018, www.cfr.org/podcasts/podcast-us-china-military-scorecard-whos-top. Accessed 5 Apr. 2018. Herring, George C. The American Century and Beyond U.S. Foreign Relations, 1893-2014. Oxford: Oxford UP, 2017. Print. Howarth, Stephen. To Shining Sea: A History of the United States Navy, 1775-1998. Norman, Okla: U of Oklahoma, 1999. Print. Kahl, Colin. “The United States Should Resolve to Avoid War With North Korea in 2018.” Foreign Policy. Foreign Policy, 28 Dec. 2017. Web. 08 Feb. 2018. Kennedy, David M. American Pageant. Place of Publication Not Identified: Cengage Learning, 2015. Print..
Kessler, Glenn. “Analysis | History Lesson: Why Did Bill Clinton’s North Korea Deal Fail?” The Washington Post. WP Company, 09 Aug. 2017. Web. 27 Mar. 2018. Lockie, Alex. “These Are the 7 Military Options Congress Has Been given to Deal with North Korea.” Business Insider. Business Insider, 01 Nov. 2017. Web. 10 Mar. 2018. Macmillan, Margarett, and Christopher Coker. “Clash of the Titans.” Www.lse.ac.uk, 1 Dec. 2016, richmedia.lse.ac.uk/lseideas/20161201_1830_clashOfTheTitans.mp3. Accessed 5 Apr. 2018. Miller, Nathan. “The U.S. Navy: A History.” Biblio – Uncommonly Good Books Found Here.N.p., 01 Jan. 1977. Web. 21 Jan. 2018. Petty, Dan. “Navy.mil Home Page.” US Navy Organization – The Operating Forces. N.p., n.d. Web. 21 Jan. 2018. Watkins, Derek. 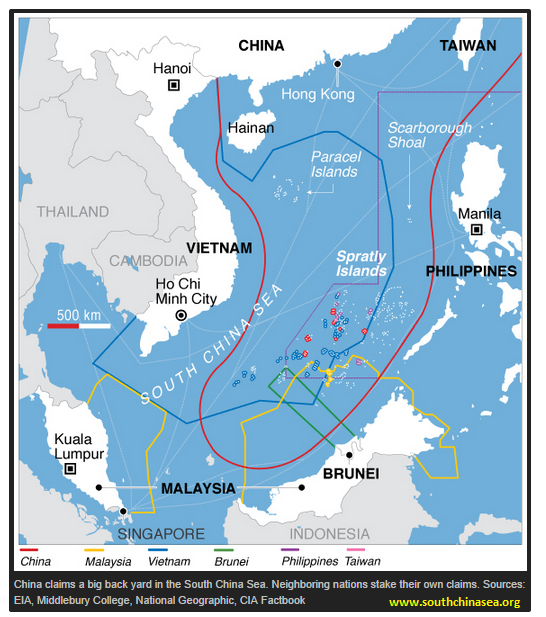 “What China Has Been Building in the South China Sea.” The New York Times. The New York Times, 31 July 2015. Web. 26 Mar. 2018. Tensions seemed to be at their high when both North Korea and Trump claimed they were ready to fight (and called each other names), but things seemed to have de-escalated. Why do you think that happened? What did Trump do that worked (if anything)? This article is great. You brought up a great point on how 70% of the earth is covered by water, which really makes sense why countries should have a strong navy. Your background information was also very strong and was chalk full of information and history. Also your present day connections and applications of a navy were extremely interesting. Before reading this article I did not realize how important a navy was. Thank you.